Because sometimes you just crave pancakes, even when you’re gluten-free. Add maple syrup and bacon (sometimes I substitute raspberry jam for the syrup), and you’re good to go. Pro tip: if you’re reheating pancakes, the toaster oven is a better choice than the microwave. Use a 0.25c measure to portion batter onto skillet/griddle. 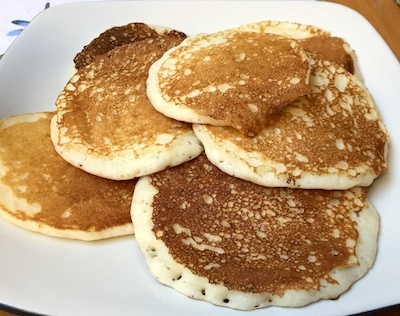 Cook pancakes until the tops bubble and bottom is browned. Flip. Cook for a couple minutes longer. Eat immediately.